With pumpkins, cool weather, bonfires, sweaters, and more, how could Fall not be the best season ever? We’ve come up with a few ideas for your apartment to help you ring in the season. These decoration ideas for Fall will make your apartment as sweet and cozy as a Pumpkin Spice Latte. An easy way to make your home more Fall festive is to simply replace some of your existing accent decorations. 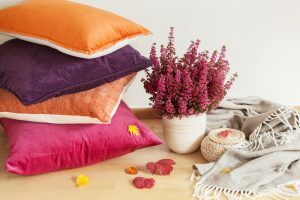 If you have blue throw pillows, maybe consider some red or orange ones. Add some colorful red or yellow dishes to your table settings. Put your favorite Fall season cooking magazines on the coffee table and switch your metal fruit bowl to a more earthy, natural one. 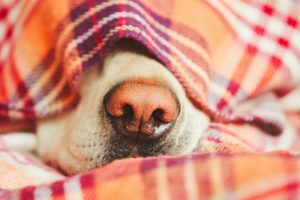 Along with warmer accents, find a super comfy throw blanket or two in a warm Fall color. Throw blankets are perfect for decorations and to cuddle up on the couch for a good movie night. A great and trendy way to display your blankets is by hanging them on a blanket ladder. Nothing says Fall like the scents of warm apple cider or pumpkin pie filling your home. Our favorite and the most affordable candles we have found are actually from Walmart. They have tons of Fall scents and a large, three-wick candle is less than $4. And this is especially true for Fall! 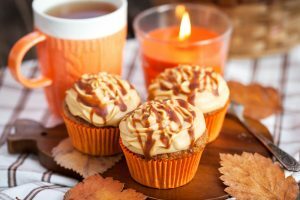 Having delicious sweet treats displayed in your kitchen will make you feel like you are back at Mom’s for the season, even if it’s not so great for your diet. Bake your favorite apple pie yourself or pick one up from the store – we promise we won’t tell. It might sound simple, but these four tricks will make your apartment feel perfect for Fall in no time. So get cozy, queue up those holiday movies and get ready to bring Fall home!